“Basura, basura, basura!” A deep voice disrupts the early morning quiet – shouting garbage, garbage, garbage– reminding us that Christmas is coming. It’s time for the traditional propinafor the garbage collection crews. We slip a few pesos into envelopes and hand them out to the individual guys. Our first year on Isla we printed our own Christmas thank-you cards, but our attempts at creativity were quickly tossed into the trash as nimble fingers emptied the envelopes and folded the currency into secure pockets. Now we just use plain white envelopes to hold the money. The end result is the same. They smile. We smile. We get great service for another year. Everyone is happy. 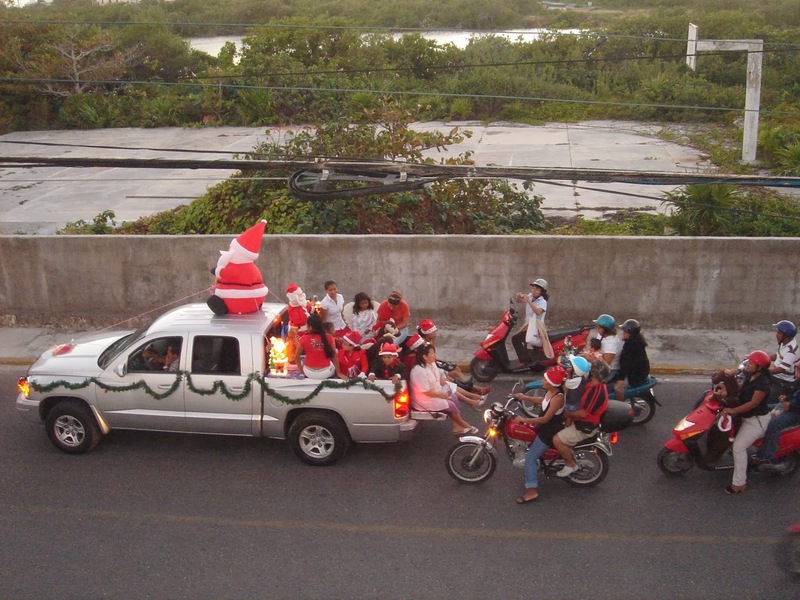 The week before Christmas is also when the municipality of Isla Mujeres hosts its annual Santa Claus parade. 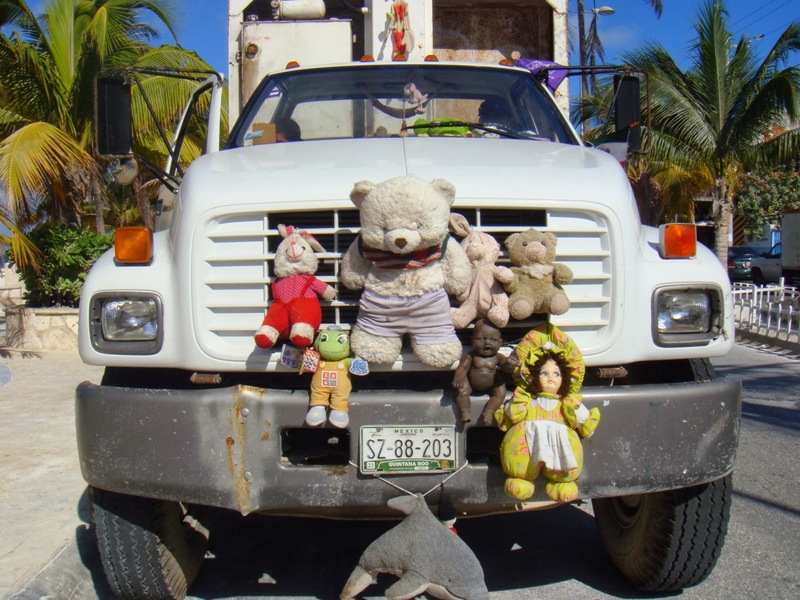 Perched on top of a decorated truck, Santa and his entourage of elves are escorted by a flotilla of cars, golf carts and motos. 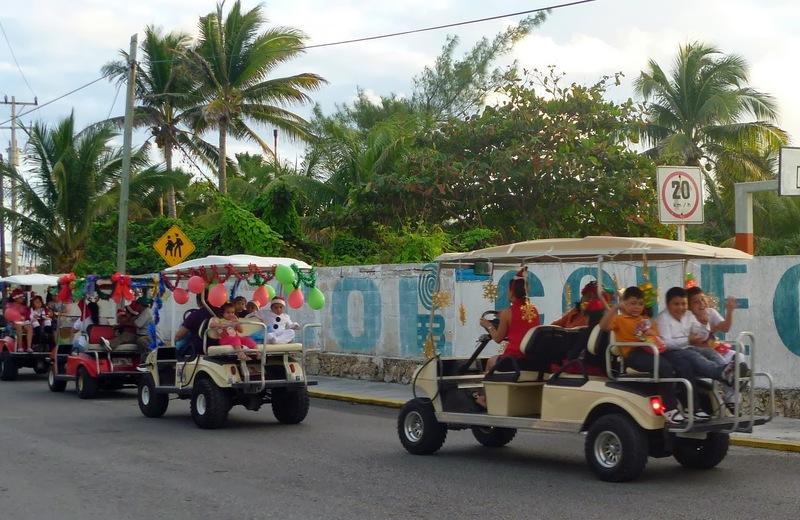 The cheerful beeping and honking of horns can be heard over the loud, thumping Christmas music as the group stutter-steps its way around the island. Eventually all of the vehicles pass by our house. Most years we stand on our upper street-side balcony, waving and snapping photographs while the participants toss candy towards us. 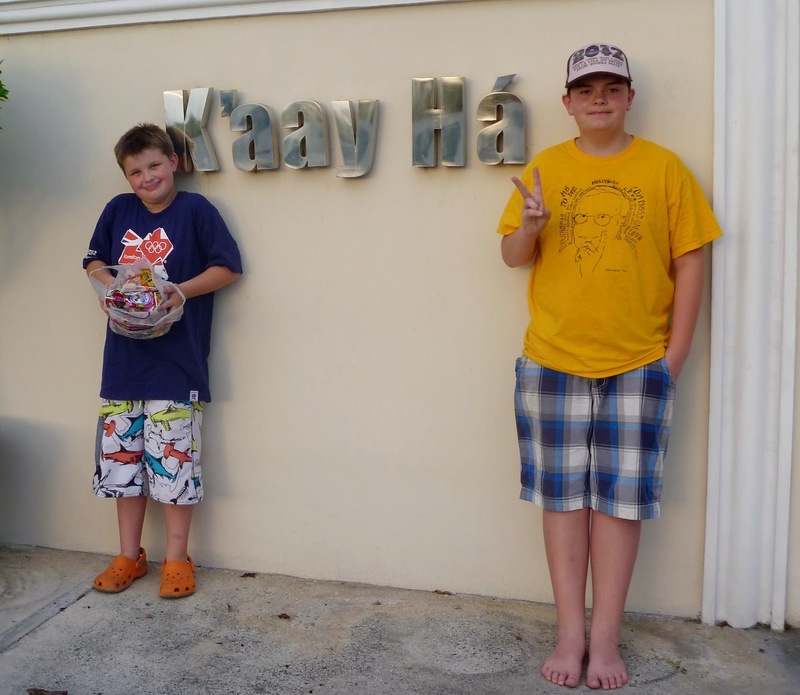 Last year the two grandkids, Ethan and Evan, were at street level and gathered up an armload of treats. Yep, just what they needed to re-kindle their over-active energy for a few more hours. 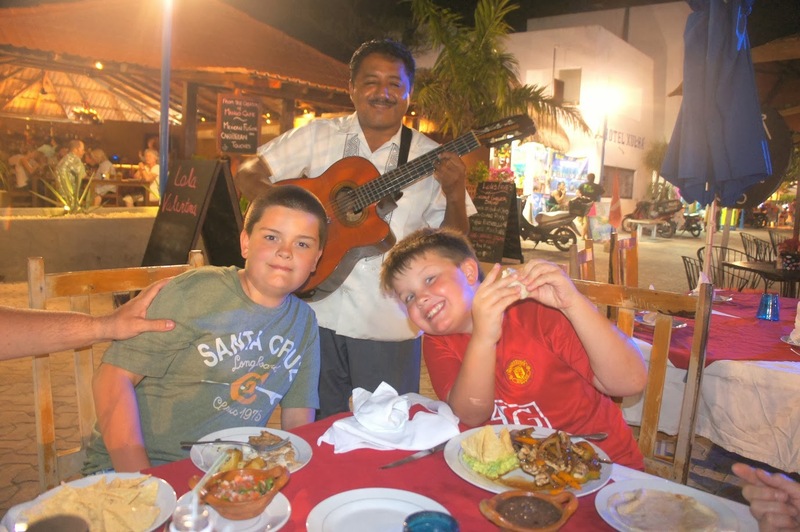 As the schools prepare for the holiday break there is the inevitable flurry of concerts, dances and parties. Students and teachers are free until after the Night of the Kings in early January. In the school yards public address systems, turned up to full volume, allow passers-by to eavesdrop on the pre-holiday ceremonies. 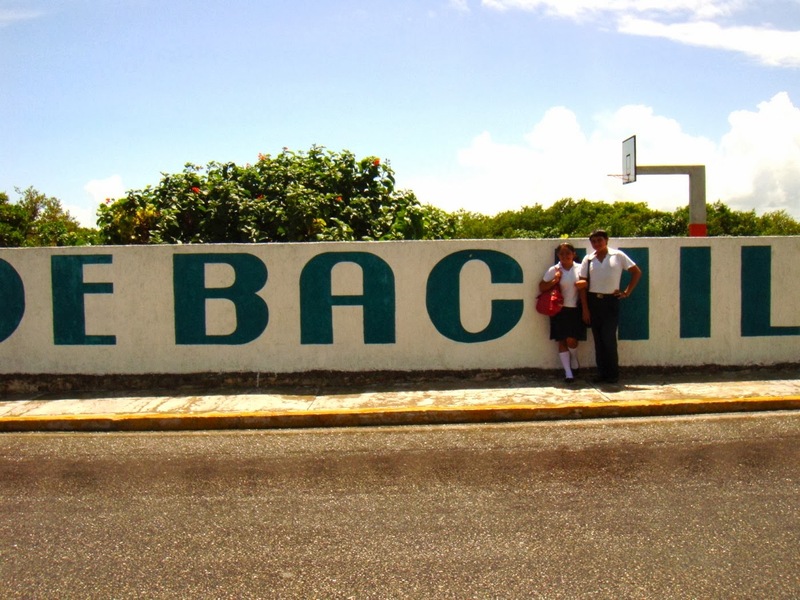 Our home is situated between a kindergarten and the high school. We listen to the laughter and giggles as the students disband for the holidays. Judging by the number of high-pitched squeals and shrieks, I am fairly certain Shrieking #101 is a mandatory school subject for female students. Inevitably the shrieking girl is being followed, or teased by a giggling boy. Good sounds. Fun sounds. This year we have been asked participate in another boisterous event. Weather permitting a sunset parade on Saturday December 21st will feature several of the Halloween costumes that we’ve purchased in the last four years. Elmo (Freddy Medina) is the star, with supporting cast members to include Mickey (Lawrie) and Minnie Mouse (Lynda), Spiderman (Darren) and Sponge Bob (Jimmy P). The Carnival troupe Algeria y Pasion Carnavalesca that Yadira Velázquez (Freddy’s wife) dances with is organizing the parade as a fundraiser for the group, and to entertain the island kids. The Christmas Season on Isla is always a noisy chaotic time and we enjoy every minute. But for us the very best sounds of Christmas are made by friends and family, sharing a meal, or snacks and drinks. It’s a time to reconnect, to remember why we love living here on Isla. As always, you nailed it! Wonderful description of Christmas on Isla. This is only my third year here for Christmas, I just love it…looking forward to the parade, and seeing you and Lawrie! Feliz Navidad Lynda and Lawrie! Wonderful stories! So envy your life in paradise as we struggle through the miseries of another Canadian winter! ¡Feliz Navidad y Prospero Ano Nuevo!